The Buddhist Publication Society is a charity whose goal is to explain and spread the doctrine of the Buddha. It was founded in Sri Lanka in 1958 . This organization has published hundreds of book, plus two periodicals still edited : The Wheel and Bodhi leaves. 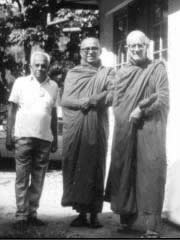 In addition to publishing, the Buddhist Publication Society hosts a free online library of e-books and also functions as a center where regular Dhamma discussions are conducted. The Dhamma Dana Initiative set up to honor the memory of Ven. Nyanaponika, acts as a charity program which donates free copies of BPS publications to universities and other institutes worldwide.